Prepare yourselves for more live SportsCenter on ESPN. One of the biggest programming shifts in ESPN history was the instituting of live episodes of SportsCenter throughout the day on ESPN airwaves. The flagship news, highlights, and information show became a near round-the-clock presence on ESPN in 2008. 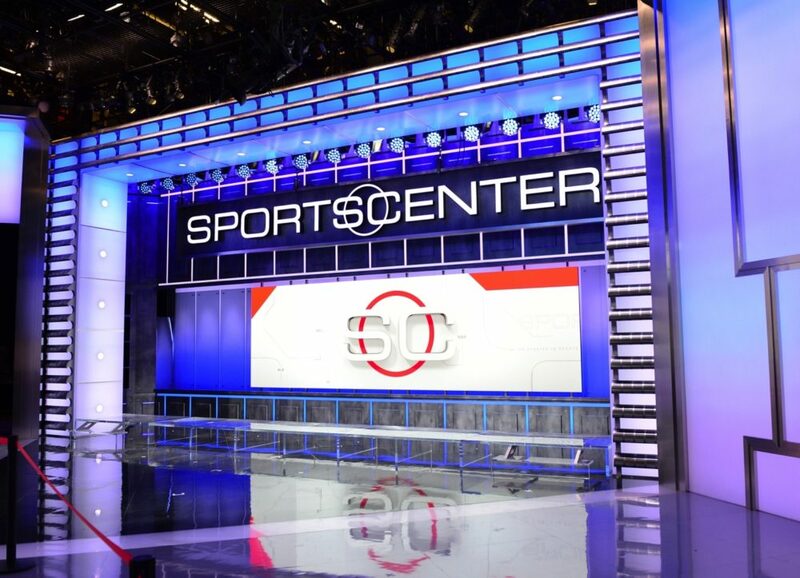 SportsCenter would go live from 9 AM – 3 PM ET every weekday to complement the early and late evening editions with even more episodes taking place on ESPNEWS. Now ESPN is tacking on an additional two hours of live SportsCenter with a new block of programming from 7-9 AM ET, expanding to 8 live daytime hours every weekday on the mothership. The new 7-9 AM block will be dubbed SportsCenter AM. And in the continuation of each episode of SportsCenter developing its own identity (something we discussed with Rob King and Lindsay Czarniak here on the 6 PM ET edition), the program will focus on the Top 10 plays of the previous night’s action and tell the major sports stories of the day through them. SportsCenter AM is being promoted as moving at a faster pace for the morning person on the go and focusing on highlights from the previous evening. In a way, it sounds like a return to the classic SportsCenter of yesteryear with less focus on analysts and talking heads and more focus on the top plays and highlights. For those of us that sometimes grow tired of the more cringeworthy moments that have populated the daytime SportsCenter episodes driven by a reliance on the former, that’s a good thing. It’s an ambitious play by ESPN to double down on even more live episodes of SportsCenter. It’ll be worth watching to see how this new SportsCenter AM distinguishes itself and offers more than a replay of the late night SportsCenter that’s also very highlight heavy. All totaled, the increase in live television has been a great success. It’s further entrenched ESPN the go-to place for 24/7 news, opinion, and highlights from the sports world. The addition of two more SportsCenter hours just strengthens ESPN’s grip and gives fans a new alternative as they’re starting their day. With the unique emphasis on the top plays and highlights, SportsCenter AM sounds like a promising endeavor for new and longtime SportsCenter viewers alike.